It’s called a bus-man’s holiday: a vacation or form of recreation that involves doing the same thing that one does at work. We were on vacation last week and I went to Morning Prayers three times, Compline (a service of evening prayers), Choral Evensong (a service of mostly music with prayer sprinkled in) and Sunday worship. It was great. There was so much incredible music. Every service was prepared with great intention and care. Every service was an instrument of God’s grace. It was a feast for me. Compline and Evensong at Memorial Church at Harvard happen only a couple of times a year so it was quite a gift that our visit to our son coincided with these services. Additionally, there was a special guest visiting from “across the pond” who both played the organ and directed the choir. Barry Rose. Barry Rose thought he’d go into business and specialize in the insurance industry. Instead he became a church musician. 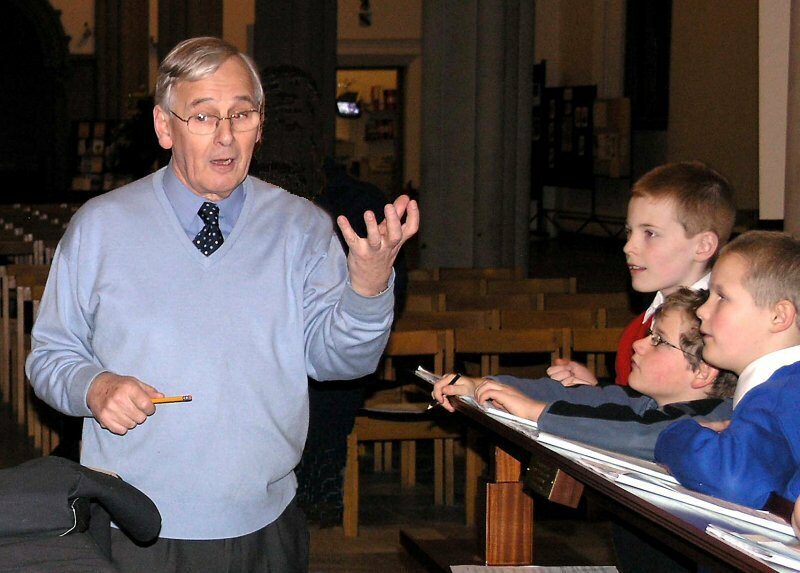 Among many other things he was the Master of the Choir at St. Paul’s Cathedral in London, directed the music for the wedding of Charles and Diana. He started his musical career as a lad playing hymns on the piano for Sunday School. Now 84 years young, Barry Rose continues to devote his life to the music of the church both old and new (with popular music also tossed in from time to time). He generously played the once-a month lunch time organ recital less than 12 hours after landing in Boston. The rest of his time was filled with rehearsing college age singers, leading worship, attending events and just being a regular attender at morning prayers. At one service I was in a place where I could watch him singing the hymn. He sang with abandon, absolute joy upon his face, smiling as he sang words of faith. It occurred to me, “That man loves Jesus.” The music and text married in him and their union found joyful expression. Would that we all could approach our own participation in the work of worship with such commitment and fullness. It is not always possible for us to lay aside the weight that clings to us, but every time we step into sacred time and space, whether it is in a church sanctuary, on a mountain top or at the river’s edge, it is an invitation to immerse ourselves in the presence of God, in whom we live and move and have our being. I found great encouragement and hope in the countenance of Barry Rose singing a song of our shared faith. May we be instruments of encouragement and hope to others every time we worship.